The Turkish Pegasus Airlines will launch direct Ankara-Baku flights from March 15, the Turkish media reports on January 17. The flights will be operated four times a week on Monday, Tuesday, Thursday and Saturday. The ticket price begins from $89.99. Tickets are already being sold. 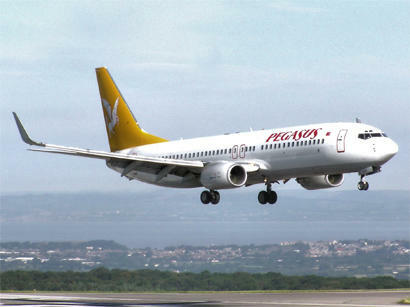 Pegasus aircraft will fly from the Ankara Esenboga Airport to the Heydar Aliyev International Airport in Baku. According to the State Civil Aviation Agency of the Azerbaijani Ministry of Transport, Communications and High Technologies, 21 airlines are represented in the country’s market, namely, ATA Airlines, Montenegro Airlines, Etihad Airways, Air Arabia, Nordwind Airlines, Ikar Airlines, Ir Aero, Al-Naser Airlines, Pobeda Airlines, SalamAir, Komiavaiatrans, Jazeera Airways, Kuwait Wataniya Airways, Mahan Air, Taban Air, Israir, Arkia Israel Airlines, Flynas, Gulf Air, Nordavia Regional Airlines, Pegasus Airlines. The Heydar Aliyev International Airport, located in Baku, Azerbaijan, is among 14 most beautiful airports in the world, according to the rating made by Curbed, an American real-estate blog network. Located in the capital of Azerbaijan, the Heydar Aliyev International Airport terminal features giant wooden cocoons designed by Turkish architecture studio Autoban. The Heydar Aliyev International Airport of the Azerbaijani capital has been listed among the top three unusual airports in the world, according to a Hi-Tech.